A lot of beer geek types traipse around town on beer tasting missions. You eventually get to the point where you identify with beer based on things that sometimes don't have all that much to do with how they taste. There's a comfort zone knowing what a beer is. If you want to shake things up a bit, head on over to the Hawthorne Hophouse this month and participate in the blind IPA tasting they've got going on. 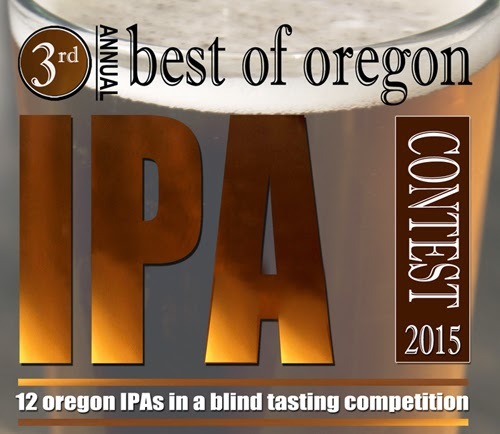 You'll get to pick your choice as the top beer from among 12 on the tasting platter, all brewed in Oregon. The top overall choice will earn a place on their tap list for all of 2015. This isn't the first time they've run this event. What's different this year is they aren't telling you which beer is which on the tray. In the past, patrons would pick their favorite from a tray in which they knew which beers were which. That's not the best way to do it if you want objective opinions because, as noted, voters can be swayed by names and labels. 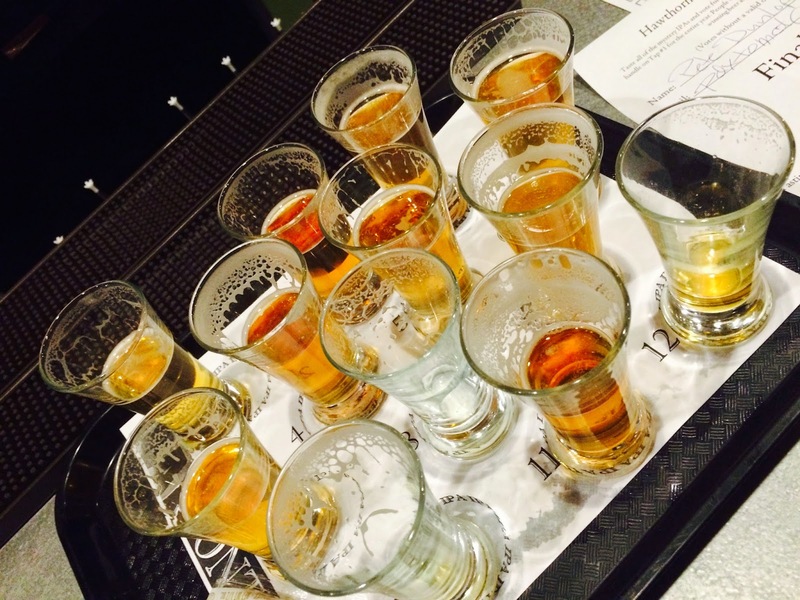 As I chewed through the tray of beers ($12 for the set), I was searching for familiar aromas and flavors. They weren't easy to find. The tiny taster glasses are not very good at spreading aroma. And the beers when initially delivered were too cold to provide full flavor. The key is to let the beers warm up and open up for a few minutes. Then you start to get a better bead on the flavors. Aroma remains a problem with these glasses. I won't say which beer I chose. That's something I don't think they would normally share, but the barkeep told me which I had chosen and which ones I marked as being short on this or that. I was actually somewhat shocked by my pick (and what I didn't pick) because it's a beer I haven't had much faith in of late. Oh well. It's nothing to lose sleep over. Check this little contest out for the rest of the month. When it's over they'll send you an email with the winning beer and, I assume, the list of beers by number so you'll know which one you chose. Good luck and good times. Update: Please be advised that these folks are also running this tasting competition at their 15th Avenue location. That was not clear to me when I wrote the piece. My 15th Avenue Hophouse bartender actually gave me the full list by number after I had voted on Monday (when it also happens to be half price flights making this a great deal at only $6). Although I had already finished the tasters for my top five, it was very enlightening to have that info as one of my 'bottom dwellers' was actually a beer that I would normally recommend as a top 3 Oregon IPA. I use quotes because all 12 of these are really solid beers. One of the things you discover when you taste these beers side-by-side is off-flavors and imperfections. It's like listening to and comparing stereo speakers...you start to pick up on things you like and don't like. Some of the beers I marked "Nope" or "Not good" have good reputations. I just did the IPA taste-off today and it was challenging and a lot of fun. I blindly picked Laurelwood Workhorse out of the bunch, which rang true for me, but it was a tough choice out of 12 solid brews, all nearly identical-looking in color, all standard style NW IPAs.